The first thing most of you are probably thinking is, “how does this compare to the Oculus Rift?”…Well, visually the Project Morpheus VR headset is very sleek, and looks like it comes straight out of a futuristic Sci-fi movie. With its bright LED’s illuminating the outter edges of the white and black head mounted unit, Project Morpheus uses a 1080p LCD with a 90-degree field of view, 1000hz display, 15mm eye relief, built in accelerometer and gyroscope sensors, and integrates with the PlayStation Camera for accurate positional tracking and PlayStation Move for motion control. It also features Sony’s new 3D audio tech, which is capable of recreating omnidirectional sound in real-time that triggers based on your head’s orientation. As with most development prototypes the specs and design concept are not finalized, and subject to change as Sony gets closer to a consumer launch. 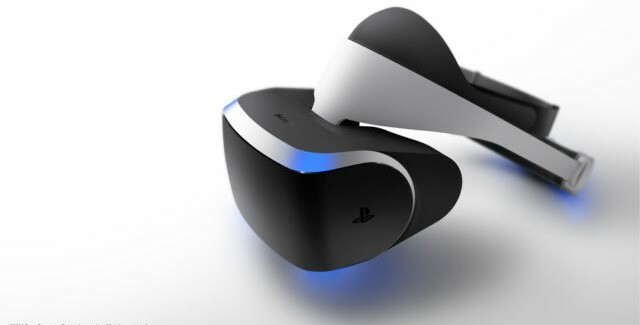 Dr. Richard Marks, Sony’s R&D unit Magic Lab, pointed out that Project Morpheus will not only be used for games, but also for non-gaming applications. Sony is attempting to go beyond just gaming with their virtual reality prototype. In a partnership with NASA, Marks is currently working on project that involves a virtual space walk on the surface of Mars. Marks went on to explain that Sony is focusing on six main areas in order for VR to be successful to gain mass market appeal in the industry—these areas include: sight, sound, tracking, control, ease of use, and content. While Sony is a super technological giant when it comes to gaming and entertainment, they find themselves playing catch up to the highly-anticipated Oculus Rift. Ever since Oculus VR began its Kickstarter campaign in 2012 for the Oculus Rift (DK1), the momentum and support has definitely been undeniable. With nearly $100 million in venture capital financing backing the startup company, Oculus VR is a force to be reckoned with—especially when stepping into their world of virtual reality. Recently, during CES 2014 a new and improved Oculus Rift prototype, codenamed Crystal Cove, was revealed with high praise. Oculus has definitely come a long way, and while competition by Sony and others continue to join the VR bandwagon, it will be a benefit for everyone in the long run, as competition will help push innovation and the VR industry forward. Sony’s Project Morpheus will be available for demonstration to GDC attendees this week. No consumer release date from Sony, or Oculus has been announced as of yet. We will be sure to keep you posted.